Recently the short documentary Earthrise was posted on Youtube. It’s an exploration of the emotional impact on the first humans to ever see their—our—lovely world in the rear view mirror. The crew of Apollo 8 journeyed to the far side of the moon and back. They became the first in human history to go far enough from the good Earth to see it dwindle into a blue marble. Curiously, there had been no advance recognition of the emotional impact of seeing what may be the most hospitable place in all of Creation from a distance,. The Apollo 8 mission is today remembered for the iconic photo of a crescent Earth rising above the lunar horizon. In photographic terms, however, what was to be one of the most reproduced images in all of humankind’s history was a “grab shot”: William Anders had been recording lunar craters on black and white film when suddenly Earth rose above the bleak horizon. He asked for a roll of color film—tossed to him, in zero gee—and caught the image in the nick of time, because nobody who’d planned the mission had anticipated the wonder of this. Mission Commander Frank Borman’s take was equally poignant: rather than astronauts, he said, we “should have sent poets.” Poets, as well as visual artists and writers can with capture how the wonder of the universe intersects the human spirit. 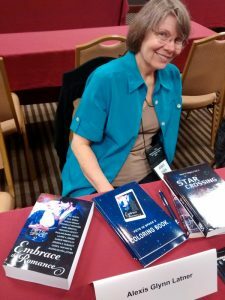 The wonder of Creation, the incomparable value of our home planet, and what it means to be human: these are some of the reasons I write science fiction. Maybe these are some of reasons you read science fiction, too. This was my street when Hurricane Harvey inundated Houston. Yes, there is a street – in fact two wide boulevards – under all that water, which is the bayou usually channeled between the boulevards. Hurricane Florence has now done to the Carolinas what Harvey did to the Texas coast last year – slam in from the sea then dawdle, dumping immense amounts of rain to result in flooding, destruction, and death. What with this summer’s hurricanes, Western wildfires, some strong tornadoes surprisingly far north, and entrenched drought in some parts of the US, individuals and institutions increasingly look either foolish or blinded by self-interest and greed as they deny climate change, or even accelerate it. They’re denying and accelerating it anyway and not just in the US. As a result, industrialized civilization may well tip the Earth’s climate into a slow but inexorable catastrophe. That’s the background of my novel Hurricane Moon. In the late 21st century, with Earth wracked by climate change, an ambitious private foundation launches a starship to find a new world. Aboard the starship Aeonare Catharin Gault, an idealistic astronaut-physician, and Joseph Devreze, a geneticist as brilliant as he is irresponsible. Aeondiscovers two Earth-sized planets in orbit around each other. Planet Green has abundant plant life. Planet Blue is an oceanic world covered with hurricanes. The green world with its bright blue moon seems like a perfect stage for the drama of civilization to begin anew and turn out better this time. But the journey took too long. A millennium of cryostasis—cold suspended animation—has caused insidious genetic damage. Now Catharin must rely on the irresponsible genius Devreze to help her repair the human genome if there is to be a future for the colony on Planet Green. Their mutual attraction ratchets up even as their conflict escalates. 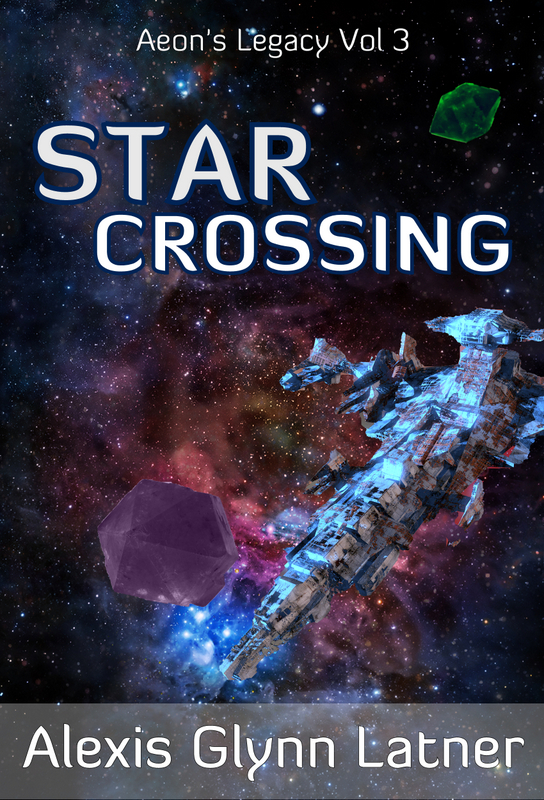 Together Catharin and Joe must decide how they can face, and embrace, a future utterly at odds with Aeon’s planned mission and their own expectations. 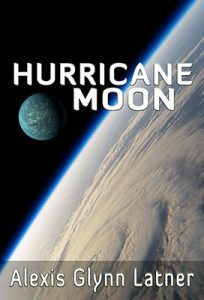 In the sense of naming times of the year for full moons – I’ve seen Harvest Moon, Hunter’s Moon, and Moon of Cold-Exploding Trees – a Hurricane Moon has to be a season of crisis. It happens that way in my novel. And it seems to be unfolding on 21st-Century Earth, starting with everyone in striking range of monstrous hurricanes, super-wildfires, and record-setting droughts and heat waves. In 1996 a science fiction story set in Paris, France, was – finally – published. It predicted glass-walled skyscrapers, feminism, burglar alarms and email. These were hardly novel ideas in 1996 or even in 1989 when the manuscript was first circulated. But the publisher originally approached by the author had rejected the story as being too far-fetched to be believable. The publisher, a businesslike fellow named Pierre-Jules Hetzel, could be excused for what might appear to us as narrow-mindedness because he’d read the manuscript shortly after it was written: in 1863—at the height of the US Civil War, six years before the golden spike was driven to complete the Transcontinental Railroad and forty years before the Wright Brothers’ first powered flight. Following this rejection, the manuscript was locked away by its disappointed author. It wasn’t seen again until 1989, when the author’s great-grandson opened the safe. The author of Paris in the Twentieth Century was Jules Verne. None of us are immune from rejection letters from hoped-for publishers. We’re not immune to rejections from friends, lovers, employers, colleges, colleagues, parents, or spouses either. May we be brave enough to write and love and hope again! “I have to report that M. Blériot, with his monoplane, crossed the Channel from Calais this morning. I issued to him a Quarantine Certificate, thereby treating it as a yacht and the aviator as Master and owner. 1909. Less than 100 years ago, an airplane crossing the English Channel was unprecedented. What will the future hold? 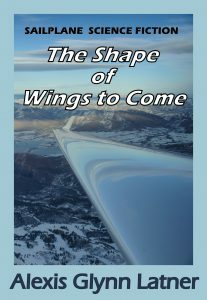 An imaginary journey from ancient Archaeopteryx to aircraft under distant stars. 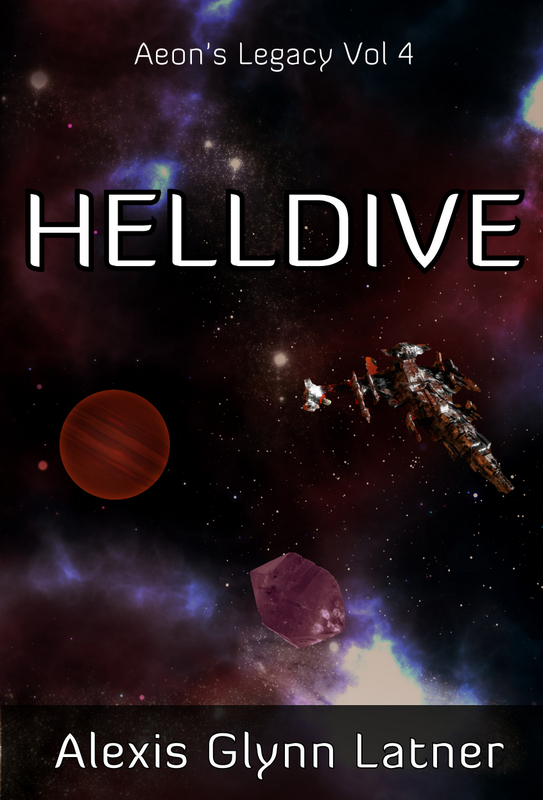 I tend to write “hard” science fiction, that is, science fiction with some actual science in it. The fantasy elements aren’t allowed to randomly trample what we know about the physical universe. The boundaries between hard and soft SF are fluid. Truth is, science is just one of the many strands that woven together make us, collectively, who and what we are. It’s an expression of our natural and so very human curiosity. Where it will lead us, we never know in advance. It was built for the International Exposition of 1889. Its winning design was selected in the face of a storm of criticism over its audacious break with tradition. Critics howled at the planned desecration of the Parisian skyline! Twenty years later the exposition concession expired—and the Eiffel Tower was slated for demolition. But that didn’t happen, and thereon hangs a tale.. In 1864, Cambridge professor James Clerk Maxwell had manipulated the equations that bear his name to predict that electromagnetic energy could travel through space at the speed of light. This prediction was experimentally verified a quarter-century later by Heinrich Hertz—but only over very short distances. Would it hold true for longer distances? In 1901 Guglielmo Marconi demonstrated that electromagnetic energy could be transmitted and detected at great distances: in a dramatic flourish he sent a signal clear across the Atlantic Ocean! The received signal was, however, incredibly weak. This meant that equally incredible power had to be poured into a transmitter to reap even a barely detectable signal at the other end. This made communication by radio slow, uncertain, and expensive—but not for long. The triode vacuum tube, invented by Lee De Forest, changed everything overnight: the triode was the first electronic amplifier, able to accept weak signals and multiply them into currents large enough be handled with ease and convenience.This was in 1907, and it was still topical news when the Eiffel Tower’s lease was up. Hard science fiction has on occasion worshiped technology at the expense of humanistic or spiritual values. 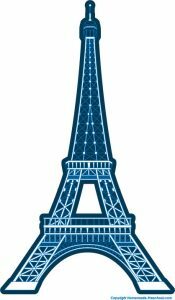 Yet consider how that the Eiffel Tower stands today because of its unforeseen utility in the era of modern electronic communications. And ponder how you’re reading these words on a screen built into what’s usually known as a “computer.” It may be a dedicated reader platform, or a smartphone, or a laptop device—but whatever it is, you probably use it for communicating, not for computing. You use it to bridge the chasm between yourself and your fellow human beings. I use electronic impulses to communicate with my readers, to tell stories. Story is something human beings have done for as long as human beings have existed. The screen at which you’re looking right now, along with the stack of books that are undoubtedly nearby, along with the Eiffel Tower, witness to our mutual need to speak, to listen, to hold, to aspire, and to dream. And I have a new novel finished – a story with science and humanity, adventure and romance, and many unexpected surprises. I can hardly wait to transmit it to the world. . . . The convention venue was adjacent to San Antonio’s Riverwalk. 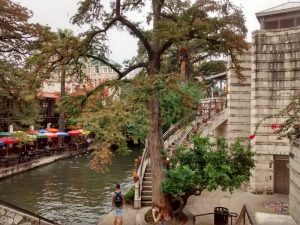 It’s one of my favorite places, an oasis in that city—though as cities go, San Antonio, with its ancient Hispanic roots, is its own kind of oasis in Texas. 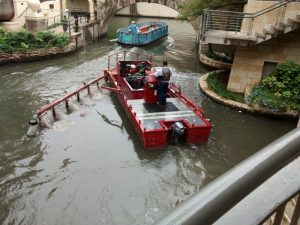 The Riverwalk meanders for miles through downtown San Antonio, though on the river’s level you’d hardly know it. 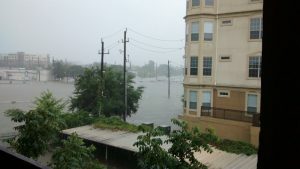 There are some shops and restaurants reaching all the way down to the water’s edge. There are also whimsical bridges and sculptures, birds, and even water taxis: it’s Venice in Texas! There’s also the aquatic version of street sweepers. 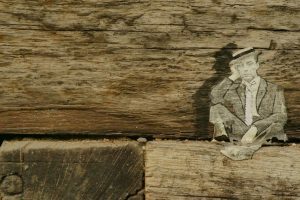 Below the Southwest School of Art & Craft, people who walk or jog by are watched by miniature folk sketched on a wall of rough timbers. Here’s one of the watchers. 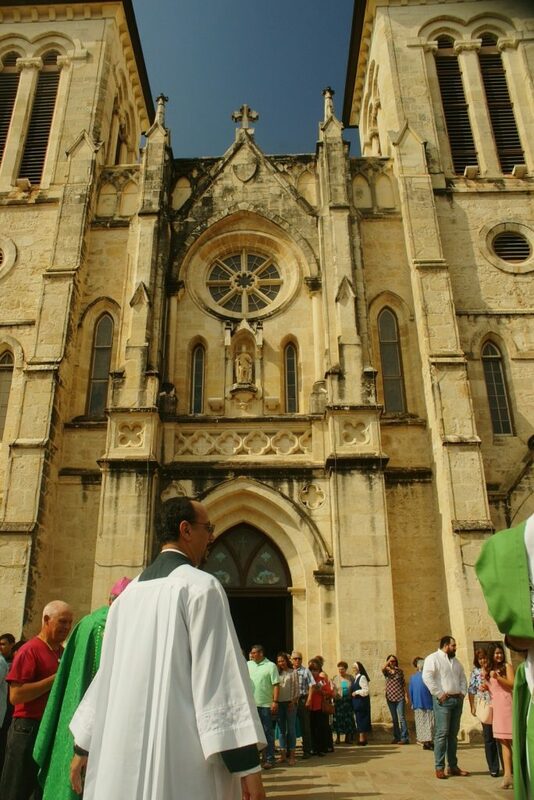 No visit to San Antonio, by someone who writes speculative fiction with spiritual angles, would be complete without paying respects to San Fernando Cathedral, or, to use the full name, the Church of Nuestra Señora de la Candelaria y Guadalupe. Portions of this cathedral date to 1738. It is a major anchor in the Mexican-American life of San Antonio. And then there’s this: the towering mosaic on the facade of Santa Rosa Children’s Hospital. 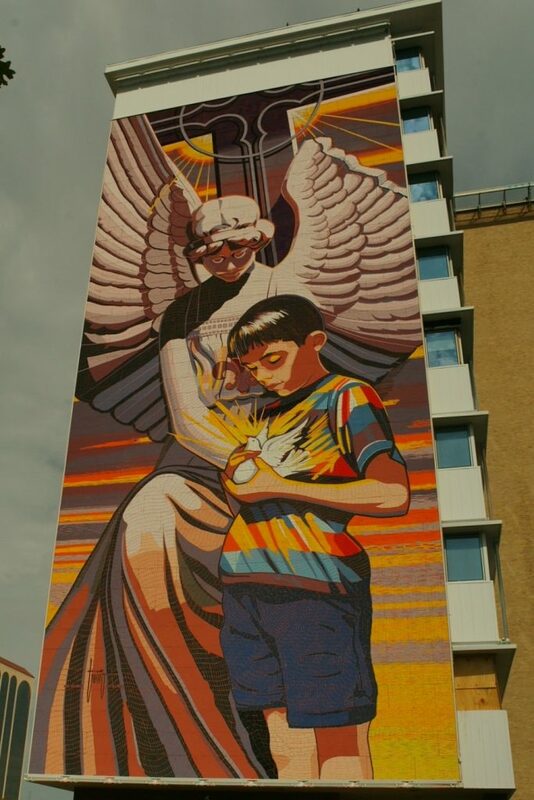 The artist is Jesse Trevino, a native son from the West Side of San Antonio, who when he was young saw a tombstone angel with a broken wing that he never forgot. The image is fantastic – a kind of sacred fantasy that speaks to the hope of healing in the real world. The image below shows a part of the world familiar to transatlantic airline pilots. You can spot the lights of Goose Bay, where an airport large enough to land an airliner serves as a sort of emergency “what-if” option for flight planning. In the lower right portion of the image you see the white ring that marks the perimeter of the Manicouagan Crater, a meteor crater fully 70 kilometers in diameter. In wintertime it’s covered with frozen water, making it so striking and so readily visible even from orbit. And the aurora borealis crowns the Earth with fire. Auroras figure into my Aeon’s Legacy series – in the novel Hurricane Moon, in which an aurora on the colony world Green is injected with the ashes of dead starfarers, adding colors to create a luminous memorial; and in Star Crossing, in which the auroras of Green are transformed into a generator for a radio message across the stars. 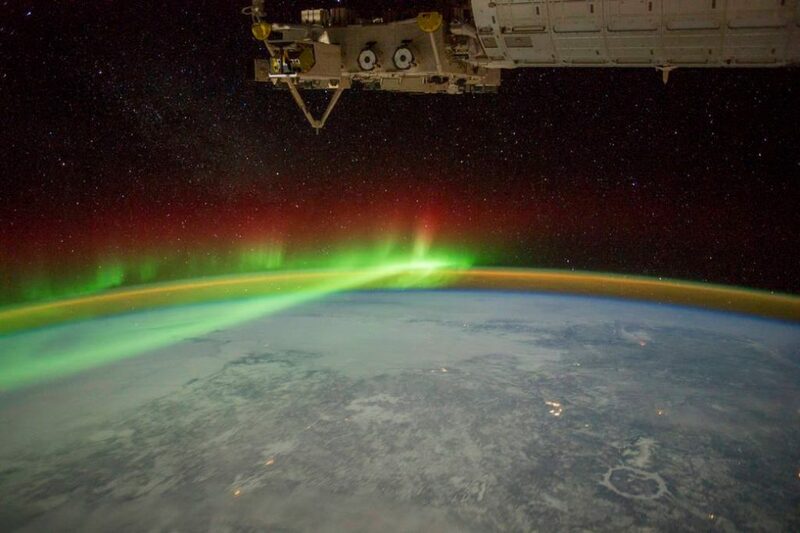 This photo, courtesy NASA, was taken by an astronaut aboard the International Space Station on February 3, 2012. 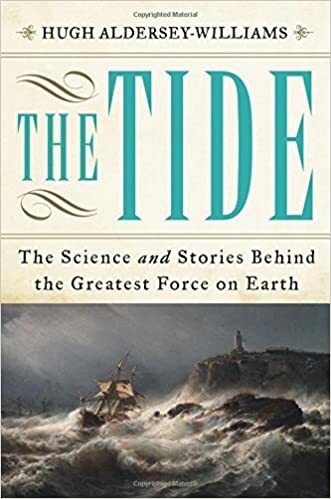 This excellent book adroitly weaves together the scientific understanding of tides, the role of tides in history and literature, and the author’s own encounters with tides. And Aldersey-Williams writes so well that his meticulous account of spending a solid day on bit of shoreline near his home in England, watching the tide go and come, is page-turningly interesting! THE TIDE was published by Viking in 2016. 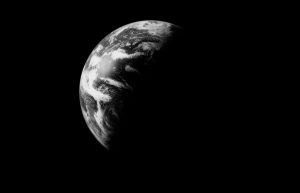 Among the interesting scientific angles is that Earth’s tides likely had much to do with the evolution of life on Earth, including stabilizing the tilt of the Earth’s axis, which limited evolved life’s exposure to climatic extremes. In looking for life on other worlds, we may need to focus on exoplanets with moons. This idea played into my science fiction novel Hurricane Moon, in which a star colonization mission seeks (and at first fails to find) a world with a large moon. This is an upcoming anthology project I’m delighted to be involved in. 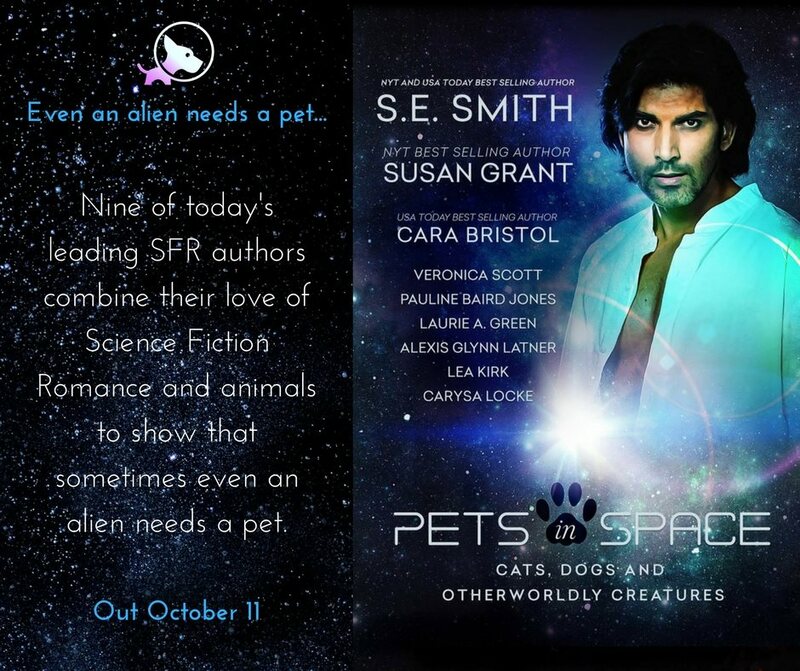 Nine science fiction romance authors are concocting stories about pets in space. Pets have a way of involving themselves in anyone’s romantic relationships – we all know that. But in this anthology, it can happen that aliens need pets; pets have pets; or alien pets humanize alienated people. Being science fiction, there are pets changed into something genetically or cybernetically way beyond just a pet. Science Fiction + Romance + Pets is one recipe that has a very different but delicious result for every one of us who is concocting it. The sexual content varies from innocently sweet to considerable heat. Pets in Space will be out on October 11th. 10% of the first month’s profits goes to Hero-Dogs. This organization raises and trains service dogs and places them free of charge with US Veterans to improve quality of life and restore independence. It took longer than I expected to make more edits than I’d hoped to have to do before this book was ready to release, but as of June 2016 it’s available as an e-book from Amazon here. I have proof copies of the print edition in my hands now.